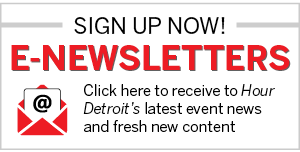 The spring thaw will soon be on, and cyclists will enjoy more dedicated lanes and recreational trails that have arrived along with Detroit’s emerging bike culture. A few city residents, however, are striving to unlock the bicycle’s untapped business potential. And while trying to turn a profit by riding bicycles in the Motor City may seem to be a financial oxymoron, two Detroit ventures are cycling their way toward viability in the marketplace. “It’s this backwards business logic, but we’re having a good time doing it,” says Hamilton Poe (shown above). 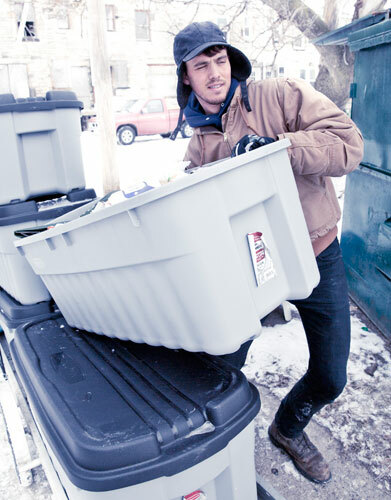 Poe, 27, rides for Detroit Greencycle, the only business in the city to offer curbside recycling pickup. Started in 2010, Greencycle charges customers to collect their recyclables in several neighborhoods — using only their bikes to do it. Landis’ experience highlights one difficulty in sustaining a bicycle-based business — even though such services are still popular in other big cities where the agile bicycle makes an ideal method for navigating congested streets and traffic obstructions. Gustav Brovold, 22, co-owner of Hot Spokes, a bicycle service that delivers takeout orders for a hand- ful of restaurants in Detroit, knows this advantage well. “It’s so much easier to get around [on a bike] when the town is gridlocked,” he says. Detroit’s wide streets and population loss may not be ideal for the cyclist who wants to make money, but the city will be soon facing the traffic-slowing construction of the hotly anticipated M-1 Rail along Woodward. For Hot Spokes, that means business potential. “I think [M-1 Rail] is going to be really good for our business. It’s going to be a total pain getting around downtown,” says co-owner Alex Lauer, 25. Hot Spokes covers many of the same areas as Greencycle — and that means a lot of pedaling. “I know the city like the back of my hand,” says Brovold, who built and customized a bike he calls a “Frankenstein” Peugeot. “It’s a pretty healthy way to make money,” Lauer adds. Greencyclist Poe has lost track of how many miles he bikes when on a route. “I usually like to think of it in terms of exhaustion levels,” he says, noting that his longest routes can take eight hours to finish, all while toting close to 300 pounds of recyclables on a trailer hitched to the back of his bike. Weather is a constant variable. Both Greencycle and Hot Spokes operate year-round, which means contending with weather challenges. “You have to ride your bike through mud and rain sometimes,” Brovold says. And that’s when the weather’s warm. Wintertime is still business time, and riders have to bundle up. “It’s important to have the right gear,” Poe says. “I have a really good pair of boots.” For Brovold, a good pair of gloves is key, as well as having a single-gear or fixed-gear bike, which has fewer parts that could break down during nasty weather. “You have to be kind of tough,” Lauer says. Says Brovold: “It’s a really good job to have as a summer job. You get paid to ride your bike around.” But wintertime usually means a shrinking staff. This past winter — including January’s polar vortex — was especially brutal. Greencycle found itself down to three riders; Hot Spokes operated with just two. Bad weather and rough terrain aren’t the only headaches. Greencycle has relied almost entirely on word-of-mouth to grow its clientele, and Greencyclist Alice Bagley, 27, calls it a “great side hustle,” but acknowledges it can’t sustain full-time employment. But while profit and expansion are key concerns for both businesses, the cyclists for Hot Spokes and Detroit Greencycle see value in their efforts that aren’t just measured on a spreadsheet. For them, riding is as much a lifestyle as an occupation. The small staffs are members of a tight-knit bike community in the city. Brovold calls Greencycle owner Landis a “great friend,” and even lived with Poe for a time. Most of the riders have volunteered at Back Alley Bikes or have worked at Detroit bike shop The Hub — and most don’t own a car.